They made it easy. Really. Whether it was asking questions to discover family members or tracing the genealogy of the family, they – my ancestors – made it easy. They left records, notes, stories. My Grandma Chenoweth had meticulously handwritten the names of her family on the back of photos. She kept a diary also. My Grandma Yess has handwritten the family genealogy. It was important we knew the stories of the family and knew where we came from. She wanted us to know how important it was we were related to the prolific Harrison family of Peoria county. She wanted us to know even though her maiden name was Smith, it really should have been Schmitt. Her grandparents had immigrated from Germany. 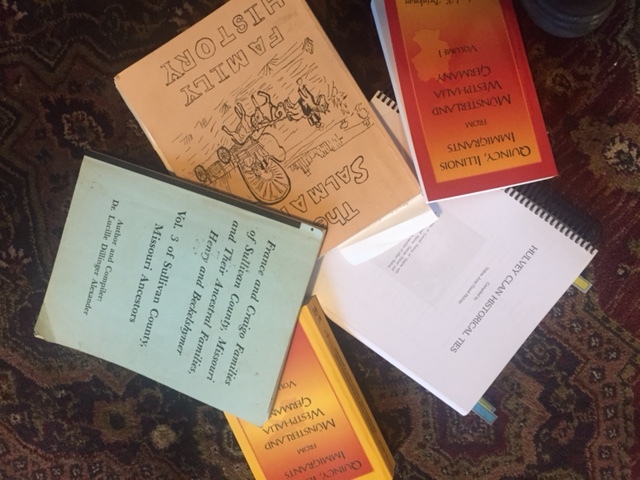 My parents are the current archivists of many of the family heirlooms. 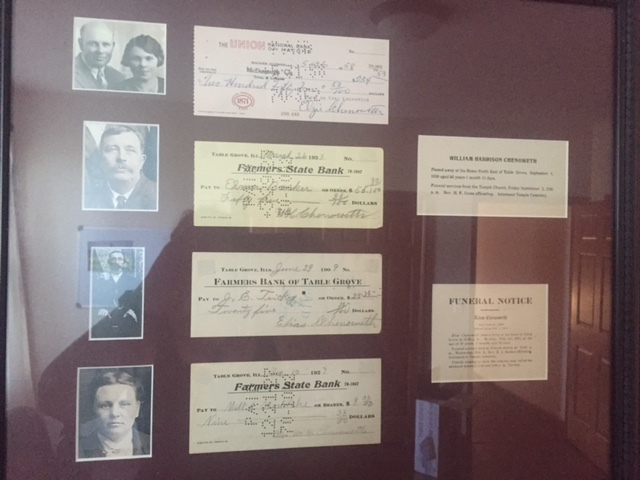 This includes the old deeds, checks and pictures of the family. It’s a true joy to rifle through the old family bible with records handwritten in German, read the letters written to my grandparents by a World War II soldier who used to work for them, and to gaze at the faces of family members. Is it just me or do you see the same faces repeated over and over within a family? One year for Christmas my parents gave my sister, my two cousins and I each a cancelled check from my grandfather, great grandfather and great grandmother and 2nd great grandfather. I took those, along with photos of each of those individuals and a couple of the funeral cards from those family members and had them framed. It’s interesting to see who the checks were written to and to compare the nearly identical signatures on the checks. 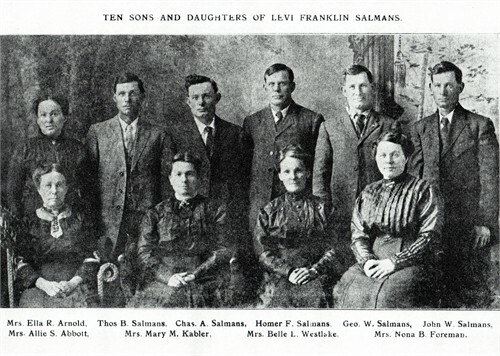 Many of the family photos have information typed or written on them much like the Levi Franklin Salmans photo above. What a tool this is! I can easily take this photo and compare it to the other loose photos within the box and separate out the different siblings and their children based on this photo. The family stories are priceless. Someone took time out of their busy day to reflect on what would be important to the family in the future. They didn’t sugar coat the story, but told the reality of what life was like and the challenges they faced. Those pithy stories are what inspire us to persevere. I’ve begun collecting recipes handwritten by my Mom, aunt, grandmothers and other family members . Recipes tell a surprising amount of information. There’s Ethel’s Salad written in my Grandma Yess’ handwriting. I’m not sure who Ethel was, but apparently Grandma liked her salad. Other recipe cards refer to Aunt So & So’s German Chocolate Cake, or Cousin So & So’s bread and butter pickles. You can tell which recipes were the favorites by the stains on the card. It may not seem very important to you today, but imagine how interesting it was for me to read my Grandma Vera Chenoweth’s diary and find out she had her FIRST decorated birthday cake at the age of 52! I hadn’t ever considered the idea of how unique a decorated cake would have seemed to her. It gave me a perspective to think at age 54 how often I had a decorated cake for an occasion. It was very easy to begin my journey to family genealogy thanks to those ancestors. I vow to make it easy for my ancestors to find it easy also. Hopefully this blog can be saved in perpetuity and someday my great great granddaughter can laugh at the picture of me in my high school basketball uniform. My future grandson or granddaughter can grow to appreciate the stories of their ancestors as much as I have. WRITE IT DOWN, please! Write about your daily life. Write about your first experience at school, your first love, your first job, your biggest triumph or disappointment in life. Share the good, the bad and the ugly, so to speak. The more honest you are when writing, the more people understand what a complex creature you are and a treasure. A – Acknowledge – share who was important to you. First teacher who left an impact, a coach who pushed you, or a friend who stood by your side should be acknowledge. S – Spell it out! Write so that the person reading can piece together the relationships of those you are referring to. Y – YOU – only YOU can leave this legacy. No one else can tell the story like you can. Write when the notion hits you or do it every day. Either will work, but just make sure to write and reflect. 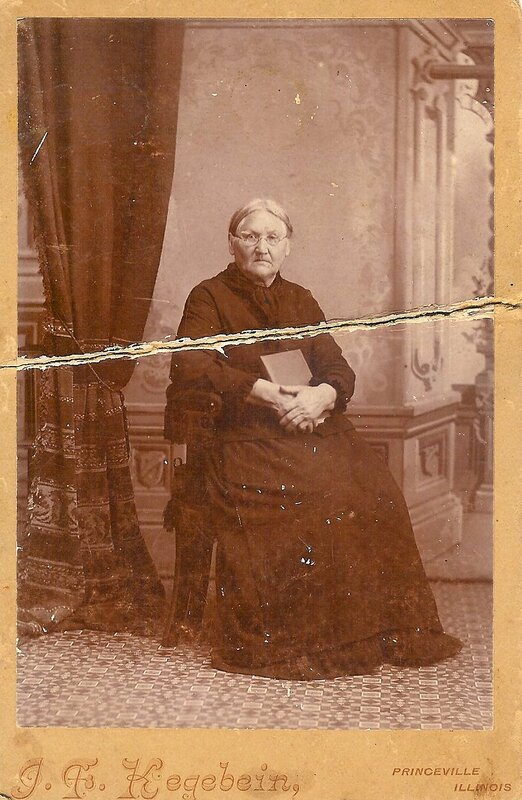 Veronica “Faroneka” Sophronia Bootz – if that really was the correct spelling of her name, was my 2nd great grandmother. She has always been an enigma. German-born with a German last name, although again I suspect it is incorrectly spelled on documents in the United States, she insisted my 2nd great grandfather Johann Bernard Schmitt Anglicize his name before she would marry him. He became John Bernard Smith. It was 1856 in Peoria County, Illinois when they married. She is one of those story puzzles you work on in 3rd grade where several words are missing from sentences and you have to guess what will complete the story. At this point, I don’t have the missing words to fill in much. What I do know was she found a way – a way to leave Hesse-Darmstedt, Germany with one of her brothers, Peter, and sister, Elizabeth, to avoid a physically abusive relationship with their father. Family records are usually homogenized. If the victors of war write the histories, then the most politically-correct Casper Milquetoast individual must be the writer of family stories. They are usually sugar-coated and boring. “George Edward was born in 1801, the third of five children….” The truly interesting and rich family histories are those that reveal what life was really like – REALLY like. Fortunately some of those stories remain in the form of family letters written to an uncle in Peoria, IL. For many years they were unreadable to my uni-lingual family. We understand English and a few smattering of words from high school French and Spanish. These letters were written in Old German- I don’t recall if it was Low German or High German. A German professor at the nearby university translated them for my mother back in the late 1970s. When we read the translation, we were stunned with the revelations disclosed to the uncle by Peter. He blatantly states he and his sisters desire to come to the United States and live with their uncle as their father regularly beat them. If you read between the lines it was obvious the uncle in the U.S. was well aware of it, but was much more kind to his nieces and nephews. So physical abuse by their father – and the desire to see the United States and prosper in the new country led to a pleading letter. There were a precious few letters between the two men. Our family is not even sure why we have possession of them, but fortunately we do. Peter, Elizabeth and Veronika Bootz found their way out of Germany and out of physical oppression at the hand of their father. They found a way to get to Peoria, Illinois. Veronika found Johann Bernard Schmitt and married him, soon to become Mrs. John Smith. How ironic the brutal reality of their family letters wove a complicated tale about family relationships that was anything but simple or homogenized. Yet, when she married and adopted the American spelling of her husband’s name, she became any other “Mrs. John Smith” in America. She found a way to slip into the shadows of the new country perhaps to hide her abusive past. Leaving the old country was not always about finding new found riches or abundant land, sometimes it was about blending in to the background or escaping your terrible past. Most important was in a time when women had little decisions to make on their own and were often victims of their circumstances, Veronika and Elizabeth along with Peter found a way.